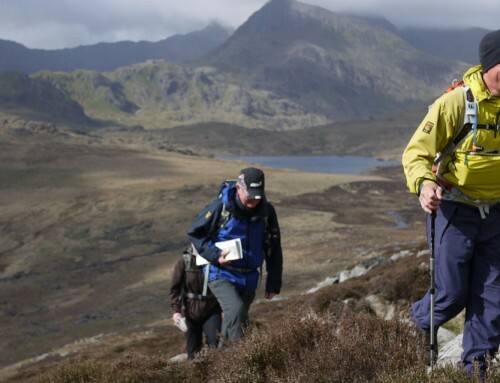 A six day training course based in Snowdonia, North Wales for people who want to be self sufficient walking, scrambling and wild camping in the mountains of the UK including the MTUK Mountain Skills course. The mountains of the UK are remote, technical and exposed to harsh and unpredictable weather. This makes them a hazardous place for novice walkers and this course is designed to equip you with the skills to enjoy them safely and includes an overnight wild camp with night navigation exercise, full navigation skills training, two days on grade 1 scrambling ground and a tour of the Llanberis Mountain Rescue Team base. 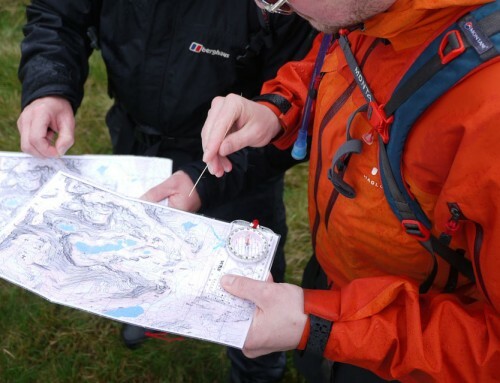 The course covers many of the key components of a Mountain Leader training course but teaches the key skills whereas the Mountain Leader course looks at how to pass those skills onto other people. This course is suitable for beginners with limited previous experience in the mountains or for people with some experience looking to build upon it. It also makes a good foundation course for people looking to progress onto the Mountain Leader scheme. We will have a late afternoon lecture on Mountain Weather on the Sunday evening. Mountain day looking at route finding and security on steep ground on grade 1 scrambling ground. We will teach you movement skills to keep you safe on classic routes such as the North Ridge of Tryfan or the Gribin Ridge on the Glyderau and teach you how to use scrambling guidebooks to to enjoy this type of ground under your own steam. Evening session – Visit to Llanberis Mountain Rescue team base to look at emergency scenarios, problem avoidance and the role of Mountain Rescue in the UK. A mountain day improving your scrambling skills on grade 1 ground and enjoying another classic grade 1 scramble in Snowdonia. On this day we will also look at emergency use of the rope to protect a nervous second or to retreat from a difficult section on a grade 1 scramble. Late afternoon session preparing for the expedition. We will head out into the mountains for an overnight wild camping expedition. Over the two days we will look further at navigation skills and we will do a night navigation exercise. We will also look at wild camping skills and how we can do this safely, enjoyably and with sympathy for the environment. We will also discuss mountain safety & emergency procedures. We run the course in Snowdonia and meet each day in the village of Capel Curig. 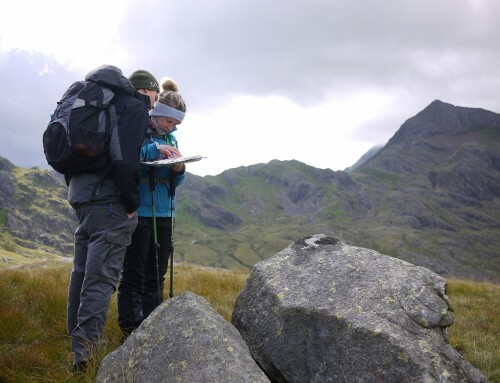 We have the right to roam in Snowdonia and so are not restricted to staying on footpaths and this helps develop our map to ground reading skills. The sun sets over Snowdon – the advantage of being able to camp up high! In May 2014 the online retailer “Simply Hike” paid for one of their employees, Shaun, to join our Mountaincraft course. He then wrote an independant review of the course on the company blog. You can read it here. The courses are run by myself and fellow instructor Huw. We both hold I hold the MIC qualifications (the highest instructional qualification in the UK) and have many years of practical experience of working with a wide range of clients. We also have a number of coaching qualifications between us and are approved providers and tutors for Mountain Training UK’s Mountain Skils and Hill Skills Awards. On top of that we share a firm belief in learning by doing and in having fun in the process! You can read more about our qualifications and experience on the About Us page. Once you book we will send you a comprehensive set of course notes and a letter of confirmation, this will include a detailed kit list and details of where and when we meet. The course generally starts at 9:30am on the first morning and concludes by 4:00pm on the last day. Just wanted to say a big thank you to you and Huw for a great course, really informative and practical but great fun at the same time. Learned more about navigation and how to use ropes than I thought possible thanks to them. They were relaxed, knowledgeable, encouraging and full of useful information and interesting facts about mist and fog, goats and urine, tweed and urine and flesh eating plants. I really enjoyed the mountain-craft course and have come away a bit more confident in my capabilities because I am now more capable. The other people on the course were nice too – we all got on really well, it was great. Might see you again next year.. Thank you to you, Huw and Rob for making our Mountain Craft course such an enjoyable and memorable week. I am looking forward to trying out all the new skills you taught us. I am also looking forward to meeting you and Steve again in the summer on your Iceland Trek. I just wanted to say a massive thank you for such an amazing week! I also wanted to write and say that Huw and Jez were amazing and made it the best trip. Could you please pass on my thanks to them. They made it a trip I will remember forever (hopefully i’ll remember some of the skills too! ha!). I will definitely be back for a course next year. I just attended your six day course. Tarquin is a god, I suspect Hugh is too, and Rob is clearly the master. what an amazing team and inspirational leaders. I have written a few words regarding my experience that if any good for you feel free to use. I have always had a terrible fear of heights, tall buildings, escalators, first floor window & even standing on chairs to change a light bulb. So, what better thing to do but book onto a 6 Day Mountain Craft Course with Expedition Guide. We met our instructor Tarquin at Moel Siabod Café. Tarquin, a gently spoken man with a relaxed and engaging manner and five of us in the group, four men and one women. Quick introductions and no time wasted as we moved out on to the hills driving out on the A5 to Pont Pen-y-benglog. The landscape was stunning and worth the six hour drive up from my home on the Dorset coast. We started with a look at maps and orientation and macro, micro navigation. I was interested in how best to navigate over mountains. It became obvious that much of it was down to common sense, look at what’s around you and match it on your map! We walked up the gentle slopes looking at distance and pacing’s, light rain and low cloud with the younger men talking about previous visits and possible routes ahead. And then the scrambling began. Tarquin our guide and instructor with tranquil style and guile led us up and down mountains in rain, hail and flattening winds, my companions were in heaven and I was in panic mode! But with good grace and charm Tarquin pulled you further and further into the adventure and upwards onto the next challenge. In conclusion was this the right course for me…no and yes.